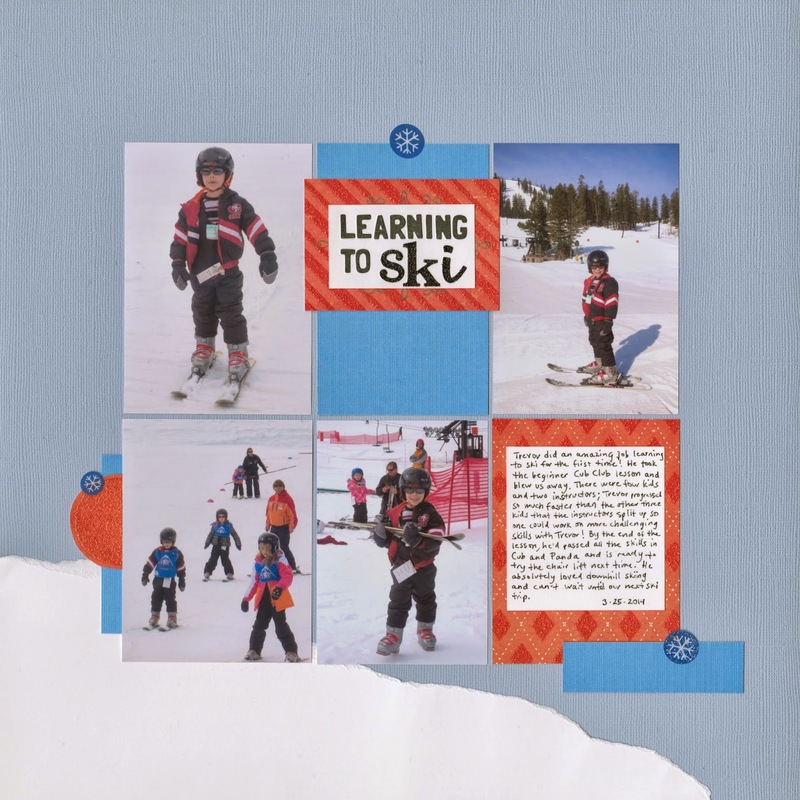 Last March, we took Trevor cross-country skiing for the first time one day and downhill skiing for the first time the following day. He really surprised me with how well he did, especially with downhill. He's always been so cautious. But on skis, he mixed his usual caution with just the right amount of risk-taking. I had a lot of fun putting this layout together and I like how it turned out. 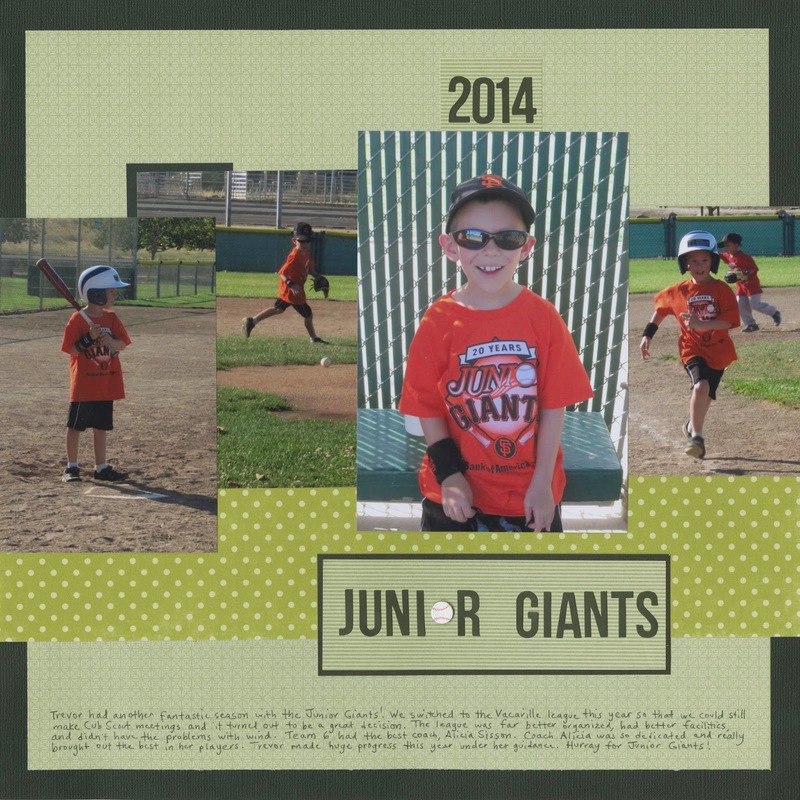 This past summer was Trevor's second year participating in Junior Giants. We changed leagues so that Trevor could make it to the Cub Scout meetings that would immediately follow his practices and games. It turned out to be a great decision, as our new league was fantastic. Trevor had an amazing coach and great teammates. He really improved as a player and had a lot of fun. As I said in my journaling, hurray for Junior Giants! Happy International Rabbit Day! Technically it's tomorrow, but there's no reason not to start celebrating early. Last year, I posted a game of Find the Rabbit, which to this day remains Trevor's very favorite of all my blog posts. This year, I thought it would be fun to show you a day in the life of the beloved 4th member of our family, Trouble. Trouble's morning begins when I get out of bed, usually in the 5:00 hour. The very first thing I do when I get up is to open the door to Trouble's cage. He usually zips right out and slams his chin down near my hand, which is how rabbits ask to be petted. When he feels I've groomed him sufficiently he'll return the favor by licking my hand, then zooms back in his cage and hops around his food dish. I fill it with pellets and give him fresh water. He has free run of the living room, dining room, hallway, entryway and stairs. I head upstairs, get ready, and then work until Trevor gets up, usually sometime between 6:30 and 7:00. We head downstairs and open the baby gates. Now Trouble can get into the family room and the kitchen. He'll usually spend some time playing with us in there, or do a Super Run or two. This morning, he played for a bit, then noticed that Steve had left his office door slightly ajar. Trouble is obsessed with trying to get into Steve's office. I took this quick picture before Steve shooed him out and shut the door firmly. You can just see a cottontail sticking out. Trouble likes to follow Trevor into the bathroom when he brushes his teeth. Trevor and I leave for school around 7:40. Steve's home, but in his office with the door closed. So with no one to supervise, the baby gates to the family room and kitchen are closed again. Sometimes Trouble accepts this; other times, he chews on the gate and rattles it to express his displeasure with being locked out. After his daily broccoli, he took a quick potty break. His litterbox is in the corner of his cage. He has never once had an accident. I headed upstairs to start work. Around 9:00, I had a visitor at the upstairs baby gate. I petted him and played with him for about 10 minutes, then he hopped down the stairs and sprawled out on the hardwood floor. I went back to work. After resting for a bit, he gnawed on some apple branches, ate some hay, and played in his tubes and boxes. Around 11:30, he headed into his favorite napping spot, an upside-down pear box. He stayed in the pear box for about five hours, then he came out, got a drink, went potty, and curled up on his carpet runway for a snooze. That didn't last long. He wasn't thrilled that I was disturbing his nap, so he went into his digging box to work shredding the old phone book we put inside. That kept him occupied for about 15 minutes. When I started making our dinner, I gave Trouble a large handful of mixed greens, which he ate enthusiastically. With a full tummy, he relaxed inside his cage and dozed. Rabbits are crepuscular, meaning they are most active at dawn and dusk. It's very convenient for people who work or go to school during the day, because their pet rabbit sleeps the bulk of those hours anyway. Trouble usually gets up from his last nap of the day around 6:45 and joins us in the family room. Here he is helping Trevor open his latest Little Passports package that had come in the mail. Around 7:45, Trouble put his chin down asking me to pet him. He loves having his ears stroked. Bunny Dinnertime is around 8:00 pm. First, I clean Trouble's litterbox. Then I give him fresh hay and water and his evening pellets. Then I close his cage door and wish him good night. After a good night's sleep, it will be time for another exciting day in the life of Trouble deRosier! Trevor has finally figured out what he wants to be for Halloween this year. 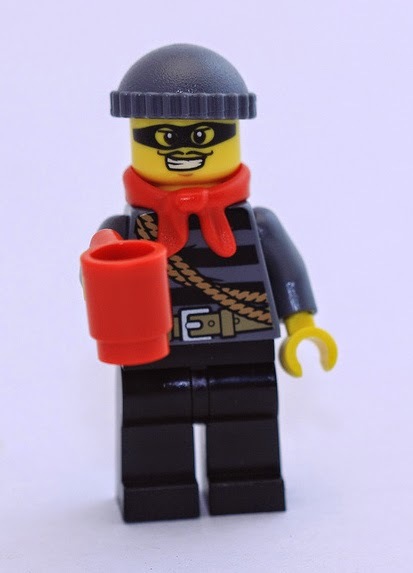 A robber minifig, from the 2013 Lego Advent calendar. But instead of holding a coffee cup, Trevor will be holding his trick-or-treat pumpkin. If I had a million guesses, I never would have come up with that. But it actually seems pretty easy. Trevor owns black pants and a knit hat, so all I need to do is make a striped shirt, a mask, and a red bandana, then add a belt and some rope. He's unsure whether he wants yellow skin or not. I'm going to insist on the mustache though. Here's a look back at Trevor's costumes from 2006-2010, 2011, 2012 and 2013. I love looking back at them. He's had a lot of fun ideas over the years. Trevor, like just about all third graders, is working on learning multiplication and division facts. We've done some flash cards and computer games and he's getting faster and faster, but still has a way to go before the facts are automatic. He does not like practicing them. I thought he'd prefer a math game I used to teach to my students back in the day. I was right. He loves it. Tic-Tac-Toe Dice is for 2-4 players. You need a different colored pencil for each person, a 0-99 hundreds chart, and three dice. Player 1 starts by rolling the dice. He must add, subtract, multiply or divide all three digits to reach a number between 0 and 99, stating the equation(s) out loud. For example, if a player rolled the 4-2-1 shown above, he could do (2+1)x4 to get 12. He would then color in 12 on the chart. Play passes back and forth between the players until someone gets five in a row. There's a lot of strategy involved in what numbers you pick. It can be just as important to block your opponent as to go for your own tic-tac-toe. Here's a game in progress. I'm red and Trevor is blue. He rolled 5-6-6. He started with 5+6+6 and got 17, which he rejected as not especially useful for either offensive or defensive purposes. He tried (5x6)+6 and got 36, which he announced was a 'maybe' because it was diagonally in line with two of his existing squares. He tried (6x6)-5 and got 31, which he strongly considered. He kept going and tried (6-6)+5 and got 5. He tried a few more options and eventually went back to 31 and colored that in. Guess who won the very first game we played? Yep. Trevor. He's using his pencil to show where he has 5 in a row (4 through 8). I don't get smiles like this from flash cards, that's for sure. One particularly awesome thing about this game is that you can adapt it to allow more difficult operations, like exponents. You can also add a fourth die to increase the difficulty. That really gets the brain working! In my book, there's nothing better than combining learning with fun. 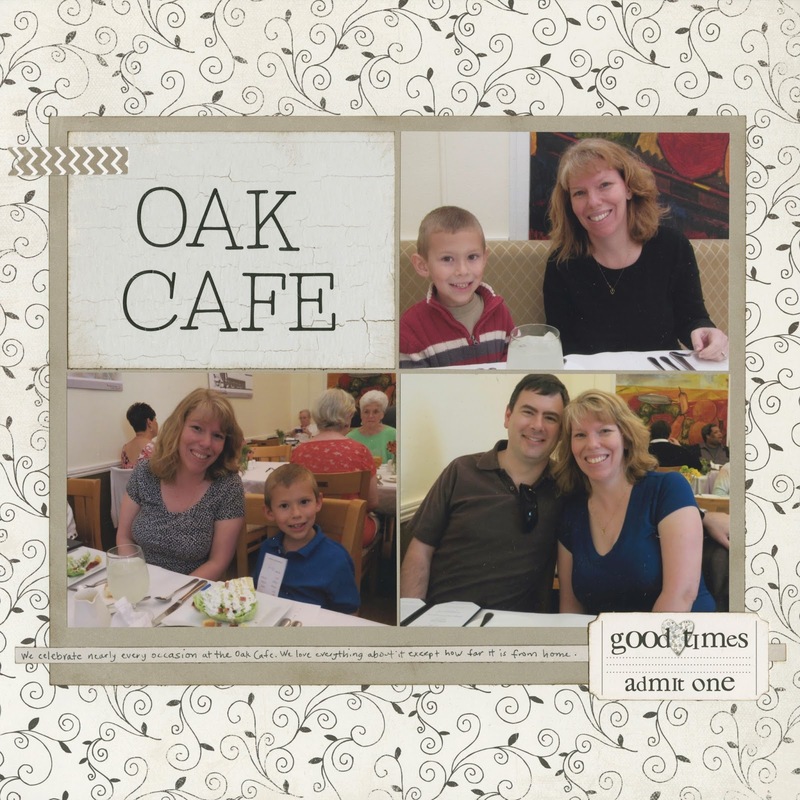 We've been huge fans of the Oak Cafe since our first visit in 2012 as #13 on my list of 40 Things. The Oak Cafe is the culinary student-run fine dining restaurant at American River College in Sacramento. The food is amazing and ridiculously inexpensive ($15 for a 5-star, 3-course meal with drink) and every time we've gone we've been impressed. They are only open for lunch on Wednesdays, Thursdays, and Fridays during certain weeks of the semester, so between the limited reservations, Trevor's school schedule and the distance from home, we only manage to go there once a semester. I wanted to scrap this place that has become very special to us, so I combined photos from three of our visits on this page. I love how it turned out. Last week, the Oak Cafe opened in their beautiful, brand-new, long-awaited facility. We went on opening day and loved it. If you're anywhere within driving distance of Sacramento, I highly recommend the Oak Cafe! I'm going to be taking this week off from blogging. I'll be back next week with layouts to share, a kids' craft or two, and a special post in honor of International Rabbit Day. In the meantime, here's a video of Trouble enjoying one of his favorite treats, an apple branch. Trevor joined the Young Readers Book Club at the library during the summer after kindergarten. He loved it from the start, and so did I. The books were often challenging for him back then, but they were interesting and he was highly motivated to read them. Each month when they met, Miss Julie led the kids in a lively discussion followed by a craft, science experiment or other activity to complement the theme of the book. Over the course of the two years that Trevor spent as a member of the Young Readers Book Club, I saw him develop from a quiet boy who let everyone else speak during the discussion to a valuable member of the club who had interesting insights and excellent recall of detail. This June, the Young Readers Book Club met for the last time. When we first heard the announcement that the book club was being cut, we didn't believe it. How could a library cut a book club? I was even more shocked to learn that the reason was because a certain administrator didn't feel that a children's book club was within the mission of the library. I was furious, confused, devastated... and started brainstorming ways to essentially demand that they keep this wonderful group intact. Long story short, I talked with the decision maker and came away even more irritated and confused than I'd already been. There was no convincing her to keep the existing book clubs, nor was she open to any compromises, cost-saving measures, expansion to include more people, or anything else. I'm so thankful for the two years that Trevor spent in the Young Readers Book Club. I'm disappointed that he won't be able to continue with it, and that other children won't get to experience it. Our libraries do so many wonderful things and offer so much, but I will never understand or support this decision. What a loss for us all as a community. After absolutely wonderful kindergarten and 1st grade years, Trevor's 2nd grade year started out a bit rocky. At the last minute, the teacher he was supposed to have took an open position at another grade level and Trevor's class started the year with a sub. She was great, but we knew she'd only be there until a permanent hire was found. That took about a month. Unfortunately, the new teacher was not a good fit for Trevor. His self-esteem and willingness to take risks suffered, so we made the difficult decision to request a classroom change three months into the school year. My request was granted and Trevor was moved immediately to Mrs. Rosenthal's class. 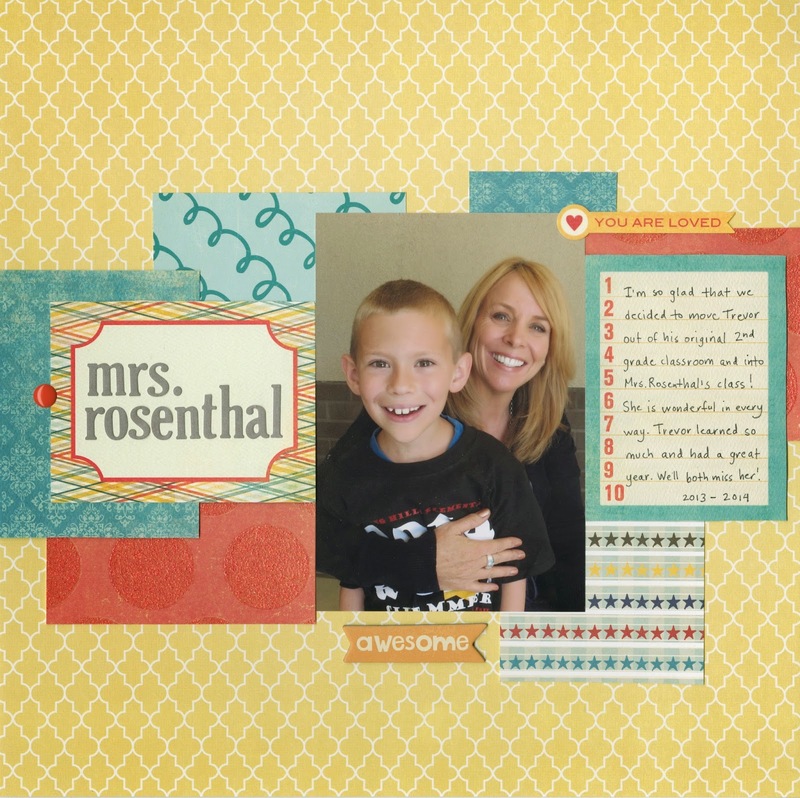 We loved Mrs. Rosenthal from the start. She was welcoming and so supportive of Trevor. He shined in her room and had a fantastic 2nd grade year. My only regret is that we didn't move him sooner so that he could have had even more time with her. Thank you to Mrs. Rosenthal for making 2nd grade so special! Trevor and I have been working on a big project, inspired by Little Passports. Little Passports is a monthly kit about geography geared toward children 5-12. There is a USA Edition and a World Edition. Last Christmas, Trevor's Aunt Teri gave him a year's subscription to the USA Edition. Trevor was over the moon when he opened the first package. It came with all sorts of great introductory materials, including a map, field guide, disposable camera, and scratch art book. He dove right in and did all the activities. He was so excited when the next month's kit arrived. And now, nine months later, he loves it as much as he did that first month. Each month, the kit focuses on two different states. Trevor gets an awesome activity-packed travel journal, stickers, postcards, and 3-D models to make. I wrestled a freshly-opened kit away from him for 2 minutes to take a few pictures. Here you can see the travel journal (with the New Jersey side showing; Montana is on the other side), along with the stickers, postcards, and models for him to punch out and make. 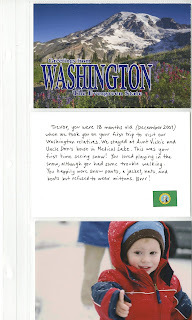 The travel journal is packed with information, puzzles, and activities about the state. This random page from the New Jersey journal has a science experience about Edison's phonograph (invented in West Orange, NJ) and a maze, inspired by the world's largest antique spoon collection (in Paterson, NJ). Here are two pages from the Montana portion of the travel journal. The left page is a puzzle based on the fact that Montana is home to more mammal species than any other state. The right page is based on Montana's nickname, The Treasure State. I have been impressed every single month with the quality of Little Passports. There is a lot of variety in the activities and it is really engaging and interesting. I would have LOVED this as a kid (heck, I LOVE it as an adult!) I'm hoping Aunt Teri renews Trevor's subscription this Christmas, but if she doesn't, we certainly will. It's really educational, a lot of fun, and a great way to make a gift last an entire year. Now, on to the project I mentioned at the beginning of the post! Trevor has been collecting the postcards from the Little Passports kits and wanted a way to display them. 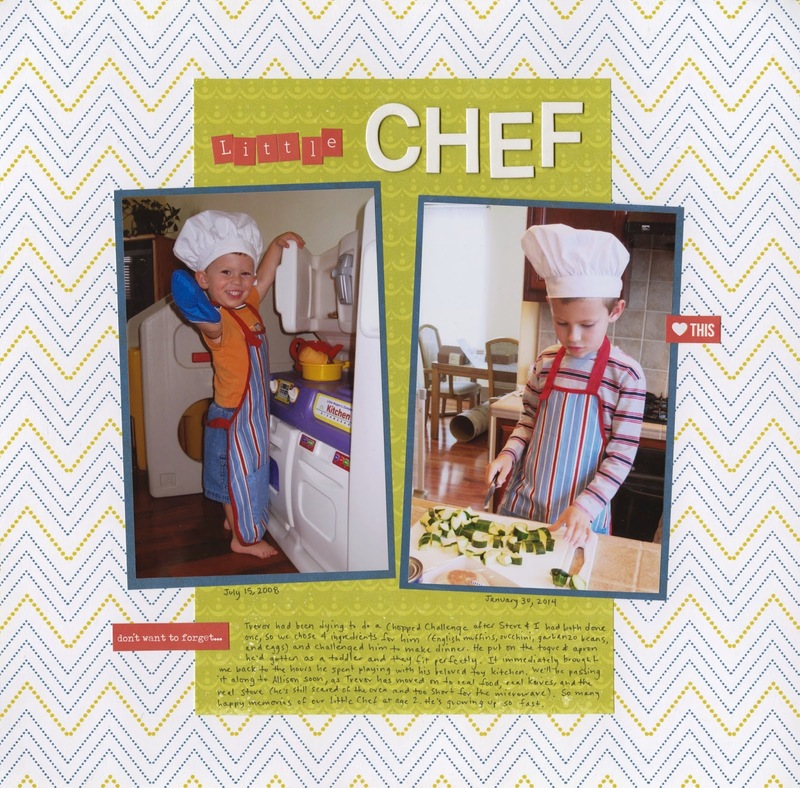 We tossed a few ideas back and forth, did some window shopping at Scrapbook.com, and then came up with a fun concept. We would find a 3-up album with 25 pages (50 sides). 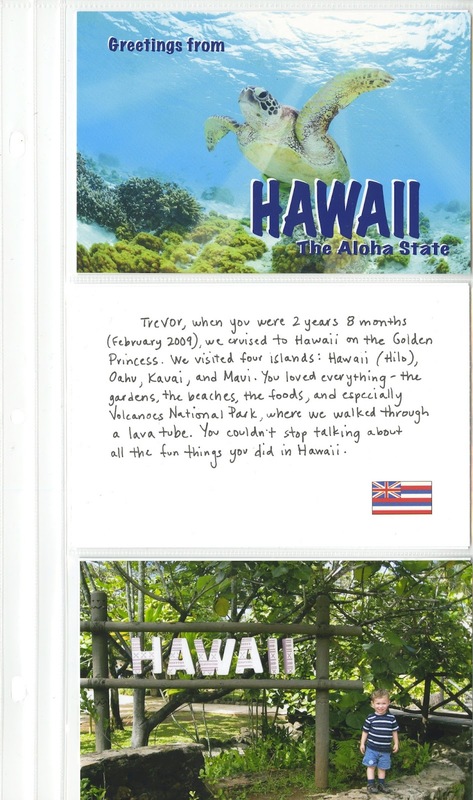 We'd put the postcards in alphabetically as they arrive in the mail, then we'd find a photo of Trevor from the first time he visited that state and put it in the bottom slot. We'd fill in the middle with journaling about the photo. Trevor was so excited. We bought the album and arranged the postcards he's received alphabetically. Then we went through my journal about Trevor to count up which states Trevor has visited. As it turns out, there are 7. He was born in California and has visited Alaska, Washington, Hawaii, Florida, Nevada, and Oregon, in that order. (Interestingly, he has been to more foreign countries than he has states!) I showed Trevor photos from each of those trips and he selected a favorite to print. I suggested to Trevor that I do the journaling from each of those states (as he was too young to remember much, if anything, now) and that he could do the journaling himself for any future states he visits. He thought that was a great idea. 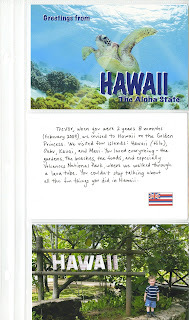 Of the seven states he's visited, only Washington and Hawaii have been featured so far in his Little Passports packets, so those are the only totally complete pages. Here is Washington, which Trevor first visited at 18 months (his first time seeing snow) and Hawaii, which he visited for the first time at 2 years 8 months. We are both thrilled with Trevor's 50 States Album and can't wait to fill in more pages as he continues his travels around the country (including 4 new states in the near future!). Thanks again to Aunt Teri for a totally awesome gift! "Trevor fell just short of 1,000,000 words during first grade, so that's his goal for second grade. 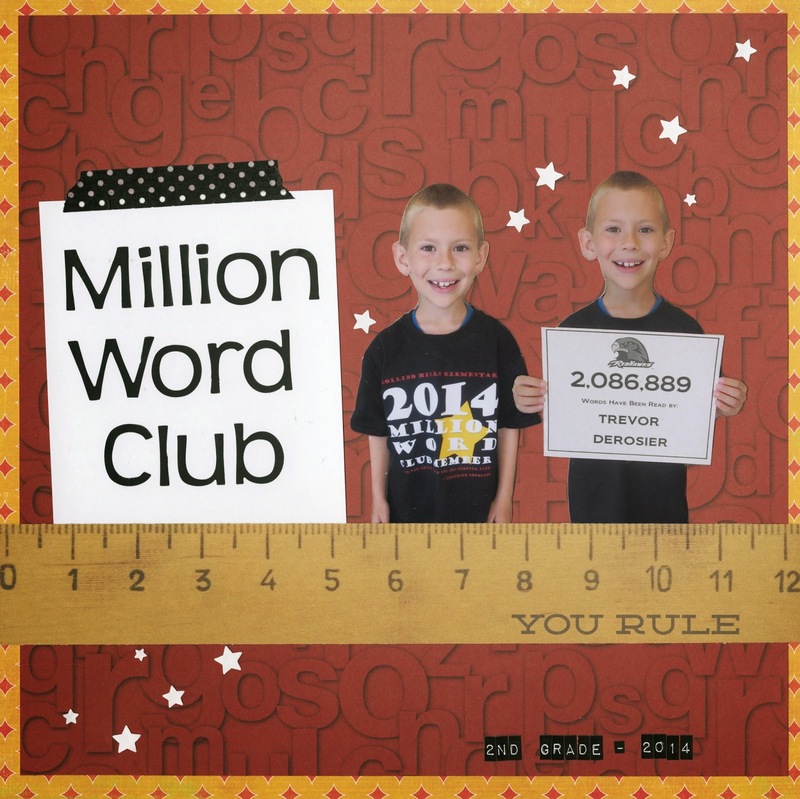 Hopefully this time next year, I can share a layout with pictures from the Million Word Club assembly!" And happily, I can! Trevor didn't just meet his goal of reading 1,000,000 words during second grade; he finished the year with over 2,000,000 words! That's a big accomplishment for a second grader and I'm very proud of his hard work. Trevor has set his aim high for third grade. His primary goal is to have his name printed in the 2 million section on the back of the t-shirt. This past year, he was around 1,980,000 when they announced the cut-off for names going on the t-shirt, so his name was listed in the 1 million section (even though he did make 2 million by the end of the year, as indicated on his certificate). He's hoping to finish the year with 3 million. I have no doubt he'll make the Million Word Club (he made the Hundred Grand Club in the first three weeks of school), but 3 million is a lot. While I support him in that goal, my hope is that he continues to love reading as much as he does now and goes on to be a lifelong reader. He's definitely on the right track. I've been working on sorting my craft tutorials by holiday and season and noticed that I have not shared more than a handful of my patriotic crafts. I haven't done too many in recent years. I did them with my students all the time, but I don't decorate my house for patriotic holidays the way I used to decorate my classroom. Here's a fun and easy patriotic decoration, adapted from a Valentine's Day classic. Start by folding one of the patterned papers in half with the design facing in. Draw half a heart along the top of the fold line. Cut out the heart, leaving the fold line intact. Use this heart to trace 2 more hearts on that sheet of paper and three on the other sheet of paper. Cut out all the hearts. You should have 6 hearts total, 3 of each color, that are identical in size and shape. Once all the hearts are ready, it's time to glue. Put glue on half of a folded heart and attach it to the next, alternating between the blue and red papers. Continue gluing the next two hearts. The glue always goes on the white side of the paper. Fold a short piece of ribbon in half and glue it between the next two white sides, keeping it as close to the fold line as possible. Then continue gluing all the white sides together until none of them show. It turns out this craft is really hard to photograph. This is the best I could manage. Fun, easy and beautiful when 32 of them are hanging from the classroom ceiling. I wish I'd taken a photo back in the day. Sadly, I have surprisingly few photos of the 11 years I spent teaching. I've been working on a huge project: organizing all of my kids' craft tutorials by holiday and season. I have about 150 tutorials, so it's taken some time. 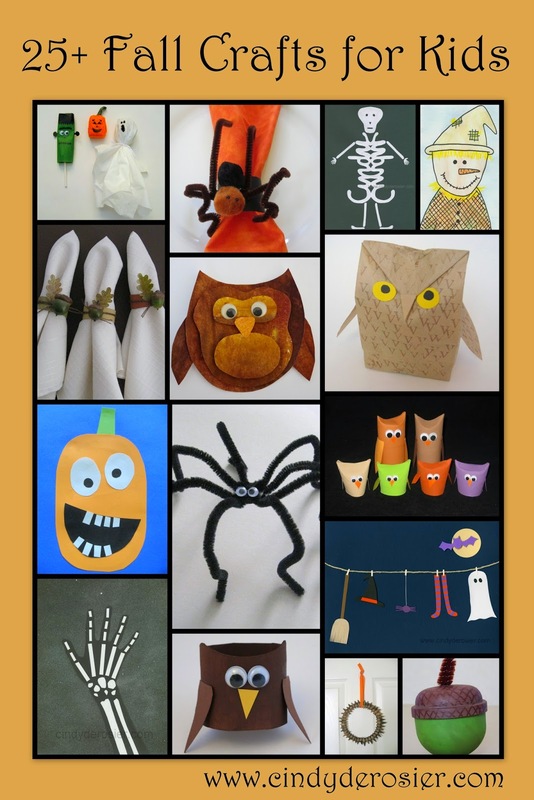 Eventually, I'll add a separate page to the blog with all the tutorials listed by holiday, but for now, here are my Fall/Halloween crafts. Enjoy! Last fall, our family joined my parents and my sister's family for a Disney Cruise. We're cruise veterans; this was my 16th cruise and Trevor's 6th. We're also Disney fanatics. Our love of cruises and our love of Disney should have added up to make this trip the best vacation ever. There were a lot of things to love: the ship was gorgeous, the staterooms were enormous, and the onboard amenities were so cool. The ports we visited were nice and the weather was perfect. But, having cruised with many different cruise lines, we've learned that each line has many things that make it distinct. Those distinctions can make or break a cruise experience. 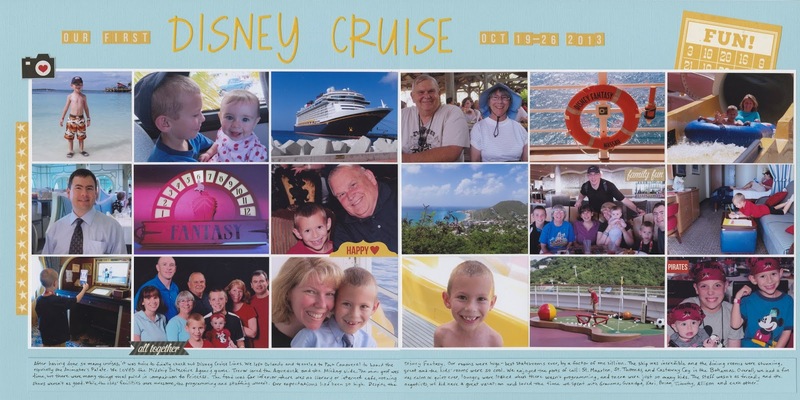 Disney Cruises turned out to not be a good fit for our family. We enjoyed the cruise, but we all knew within the first 3 days that we would probably not be cruising with Disney again. There are other lines that serve much better food (a big priority for Steve and me), have better entertainment (surprising that Disney wasn't top-notch in this regard), and provide more opportunities for families to spend time together (as opposed to Disney's efforts to provide something for each member of the family to do... separately). We really disliked that Disney would lock lounges that weren't actively being used for programming; it meant that we couldn't find a place for our group of 9 to gather to play games or just hang out. The photos highlight the best of our trip, while the journaling mentions the things we loved as well as the things we didn't. I'm happy with how it turned out. I don't love it, but I don't hate it either. 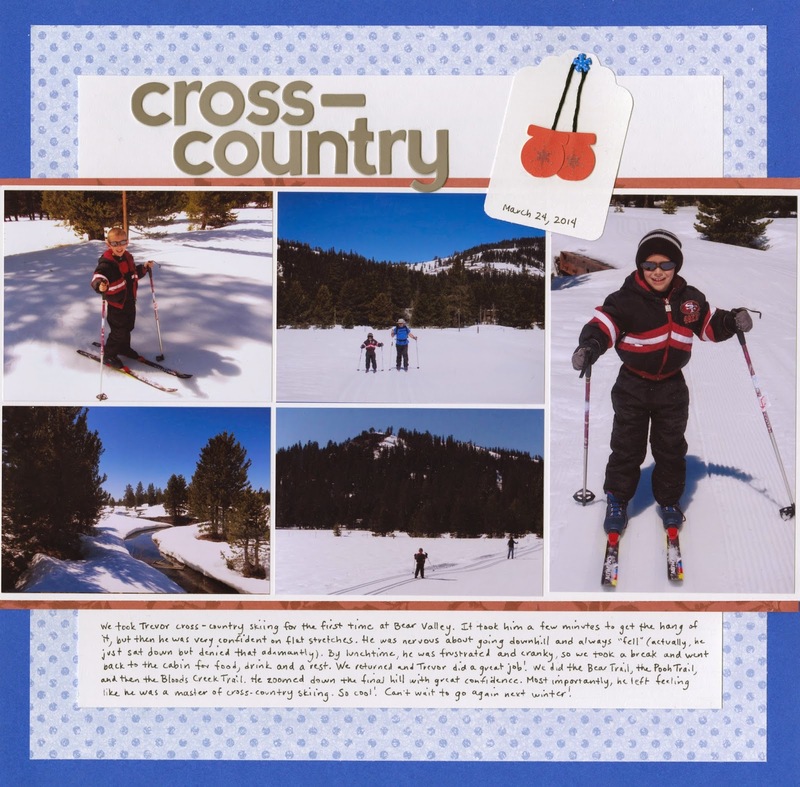 I'm glad it's off the desk and into the album, my story of Trevor's first time trying cross-country skiing safely recorded. Fingers crossed the next layout goes more smoothly. As promised, I'm finally getting around to sharing the recipe for my blue-ribbon-winning Pineapple-Zucchini Bread. Drain the crushed pineapple, reserving 1/4 cup of the pineapple juice. Combine the eggs, zucchini, crushed pineapple and juice, and vanilla extract. In a separate bowl, mix the remaining ingredients, then stir into the liquid ingredients until just moistened. Divide the batter between two greased loaf pans. Bake at 350° for approximately 50-60 minutes, or until it tests done. Let cool in the pans for 10 minutes, then remove from pans and cool completely on wire racks.